Reykjavik Bike Tours is a small, but well-run bicycle touring operation that gives informative and entertaining guided bike tours around the city center of Reykjavik, Iceland. The tours aren’t long or particularly challenging (anyone who knows how to ride a bicycle can participate), but the experience of cycling around downtown Reykjavik while at the same time learning about the city, its people, and its history is something you will remember for the rest of your life. During a recent trip to Iceland, I decided to join Reykjavik Bike Tours for one of their “Classic Reykyavik” tours – the company’s most popular tour on offer. My friend and ex-college roommate, Brandon Roesler, would be also be joining me. We booked the tour with Reykjavik Bike Tours by simply sending an email to the address listed on the company’s website. Within 24 hours, Stephan (one of the company’s two owners/tour guides) had emailed me back with all the details for the tour, the start time (10 AM), and directions to our meeting point at the Old Harbour in downtown Reykjavik. When the day finally arrived for Brandon and I to participate in the Classic Reykjavik bike tour, we woke up early and made our way to Reykjavik’s Old Harbour where we found Stefan and Ursula standing outside the two small shipping containers that function as the company’s storage facility and headquarters. Stefan and Ursula greeted us with large smiles and friendly handshakes. Also on hand was Stephan and Ursula’s adorable young daughter, Anna, and three other tour participants – each of whom was from a different part of the world. The Classic Reykjavik bike tour is both the shortest, easiest and most popular tour on offer by Reykjavik Bike Tours. Anyone that knows how to ride a bicycle can participate. Free helmets are provided by the company to those who want them and there are no hills to speak of during the entire 2.5+ hours of the tour. You do, however, need to know how to ride a bicycle, cross the street with confidence and stop on command. Personally, I think the Classic Reykjavik tour would be a great way to spend the day with a friend, significant other or the entire family. When you arrive at the Reykjavik Bike Tours headquarters down at the Old Harbour area of downtown Reykjavik, you will first be equipped with a bicycle, helmet, and (if you want it) a bright yellow safety rest. 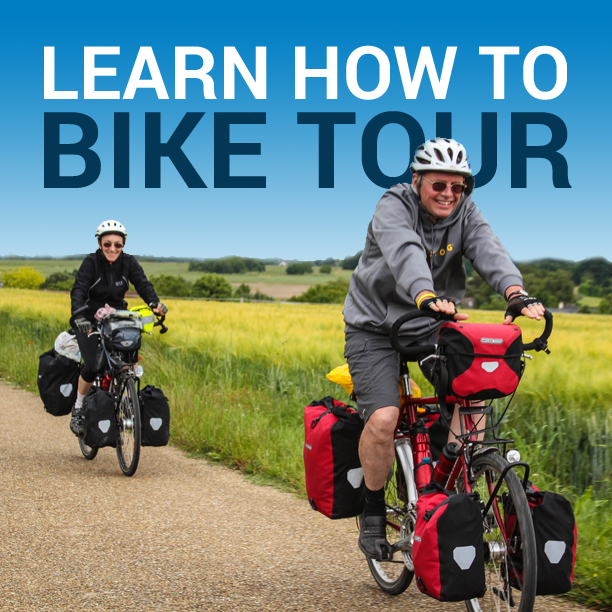 While you can bring your own bicycle on the tour if you like, most people don’t go through the hassle. Instead, the company has a small fleet of bicycles on hand, which they provide for use on any of their guided bicycle tours. The bicycles are commuter-style bicycles with flat handlebars, a casual riding position and smooth city tires. 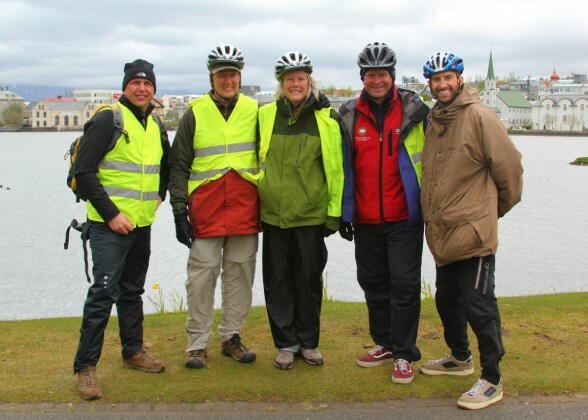 After each of the tour participants had been fitted on their bicycles and had taken a short test ride up and down the pier, our bike tour of Reykjavik began! There were five of us in total, with Stephan, our leader, bringing the total size of the group to six. The tour began practically right where we started – in the Old Harbour. It was here that Stephan familiarized us with Iceland’s oceanic history and discussed his country’s controversial whaling practices. Then, just a short distance up the road, we were taken inside one of Iceland’s most famous seafood restaurants, where we met the wacky old man that acts as the owner and were told that if we had time, we should come back to the restaurant after the tour was over (which Brandon and I did!). Cycling just a short distance down the street, we stopped at a hot dog stand where a certain ex-president of the United States once ordered a hot dog. We also learned that while seafood is certainly popular in Iceland, it is actually the hotdog that is now the country’s most popular dish. Crossing into the town center, Stephan pointed out some of the city’s best examples of tin and grass roofed houses. The highlight of the entire tour for Brandon, however, was when Stephan shared with us the story behind Iceland’s “hidden people” – invisible elves of Icelandic folklore that are believed to live in the rocks around Iceland. In the center of town we made a quick stop at a famous church where the Pope once visited and went inside a modern building to study a large-scale topographical map of the country. Cycling our way across town and down to the beach, we took some time to snap our photos with the Reykjavik skyline in the background before making a quick stop outside the modest home of Iceland’s most famous eclectic performing artist – Bjork. Before any of us knew it, we were back in Reykjavik’s Old Harbour and our tour had come to an end. As with so many good and enjoyable things, our time with Reykjavik Bike Tours had flown by. We had learned so much in such a short amount of time; we had cycled practically all the way around the city; and we had enjoyed both our guide and the company of the others participating in the tour. While I was certainly impressed with the Classic Reykjavik bike tour, I was shocked when I heard Brandon say that his time with Reykjavik Bike Tours was his favorite part of the 25 days we spent in Iceland. This entry was posted in Bicycle Touring Pro Articles, Europe, Iceland, Locations, Main Articles, Product & Service Reviews and tagged bicycle iceland, bike iceland, cycling in iceland, fun things to do in reykjavik, iceland bicycle tours, iceland bike tours, iceland by bike, reykjavic iceland activities, reykjavik bike tours, reykjavik iceland, sporty things to do in reykjavik, what to do in reykjavik.